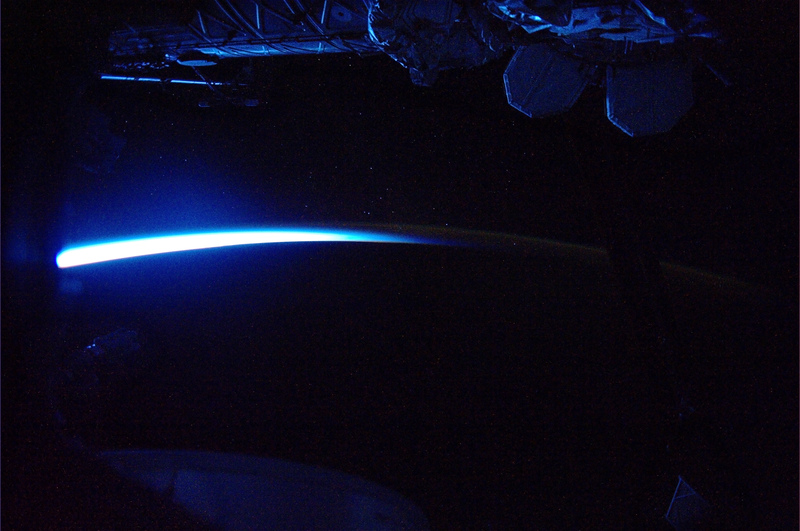 It may look like a science fiction film but it’s very much science reality: a view from the window of the International Space Station, taken on November 7 by astronaut Doug Wheelock, shows external structures lit by a cool blue light reflected off our planet – “Earthshine” – while the bright crescent of dawn blooms within the thin line of our atmosphere. Stars – the light from other suns billions and trillions of miles away – shine in the distance. It’s another stunning view of our world from 220 miles up, and through the “miracle of modern technology” we are able to share this view and many others like it as quickly as the images can be uploaded to the internet. And, of course, if you’re already a reader of my blog thanks for the continued support over the past year-and-ten-months (yes LITD will be turning 2 in February 2011!) I hope you’ve been enjoying the images, links and videos from around “our planetary backyard.” It really is a beautiful place, we’re lucky to be a part of it! Stunning images. Thanks so much for sharing! I look in awe and wonder at these pictures. They deeply move me, and I much appreciate you guys sharing them with the public. I posted today’s picture “Earthshine” on my blog today. I added a hyperlink directing to this page, so I’m hoping it will generate extra web traffic to your site. Hi Jason, Thanks so much for sharing all these wondrous pictures and your comments with us. I will obviously never get to see this first hand, but I can well imagine it must make the heart swell in the chest to view all this first hand, to experience what you experience in doing this. You must feel so lucky to do so, even though you would have had to work hard to get where you are. Not so much a job as a passionate vocation and something that you can enjoy too. Isn’t it wonderful too that we can enjoy all this via you guys because of the technology we have today. Amazing.